Aristotle, the ancient Greek philosopher, thought that meteors were gases that rose from above the Earth's surface during the day and then ignited once they reached a certain height. It was a nice theory but wrong. But then he did not have the Director of the British Astronomical Society's Meteor Section, Neil Bone, as a consultant. Neil visited us for our June 2004 lecture and firstly led us through some of the jargon used in the field. The things we know as "shooting stars" are the actual meteors. If it makes it down to the ground it is classed as a meteorite and whilst trundling around in space (minding its own business before this big rock called Earth gets in the way) it is known as a meteoroid. So, meteors start off in life as meteoroids. Most of them are 'born' when a comet comes close enough to the Sun to be heated up. As comets are not solid bodies but are made of a loose packing of rock and ice some of their material is shed along the way. Scientists often refer to them as "dirty snowballs". Over time as the comet repeatedly passes around the Sun the debris builds up until the whole path of the comet contains material it has cast off on its travels. If Earth's path coincides with that of the comet then this debris smashes into the upper atmosphere at speeds of up to 160 thousand miles per hour! Even though meteors are only usually the size of a grain of sand it is their high impact speeds that can lead to very impressive light shows. If a meteor is large and fast enough it can appear as bright as Venus and it then classed as a fireball. In fact fireballs as just as common in daylight but tend to go unnoticed. However, you need to rule out other man-made causes first. In September 2003 an American teenager photographed a bright streak in the sky and at first the media and NASA scientists thought that is was a fireball. However, on closer examination of other photographs of the fireball it was deduced to be the contrail from Concorde. There are 20 regular meteor showers each year but some are easier to see than others. Ideally, you need a dark sky away from city lights and a red plastic film over your torch so you don't destroy your night vision. Dress in some warm clothes (a sleeping bag would keep you cosy on colder evenings), take a hot drink in a flask and lie out on a sunbed or something similar. Each shower has a point of origin in the sky known as the radiant. This is where the meteors appear to come from. 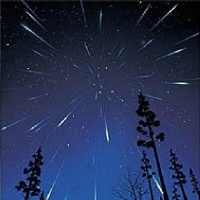 To view the meteor trails do not look directly at the radiant but slightly away from it. The next major shower is due on the night of August 11th-12th and there should be some activity from 10 o'clock onwards. The meteors are known as the Perseids as they appear to emanate from the constellation of Perseus which is in the North East part of the sky at that time and date.